15L. Secchi on bottom. Incoming neap tide. Tiny cyanos cryptos and chloros P. 105000 unk (1 foram 1 raphid 1 diatom?). MCloudy 10-15 SE barometer 766.5. 15L. Secchi on bottom Neap incoming tide. PCloudy 10-15 N 765.2 barometer. 15L. Secchi on bottom. Tiny cyanos cryptos and chloros P. 35000 unk dino 35000 unk. Sunny 5-10 E incoming tide barometer 770.8. 15L. Secchi on bottom. Tiny cyanos P C&C P. 35000 tintinid. Mcloudy 5-10 E barometer 763.1 incoming tide. 15L. Secchi on bottom. C&C P. 35000 unk. Pcloudy 10-15 S incoming tide barometer 764.4. 15L. Secchi on bottom. C&C P. 35000 unk dino (Kato?). 35000 pine pollen. Sunny 5-10 SE incoming tide barometer 771.0. 15L. Secchi on bottom. 1 slide then scan. On scan noted Odontella. C&C P. Sunny 5-10 N Low tide. 769.3 barometer. 15L. Secchi on bottom. Cryptos and chloros P. Pcloudy 5-10 N incoming tide neap barometer 768.9. 15L. Secchi on bottom. One slide then scan. On scan noted karlo unk diatom thalassionema karenia PN ciliate. Cryptos and cchloros P. 105000 unk. P cloudy 5-10 S outgoing tide 762.9 barometer. 15L. Secchi on bottom. Tiny cyanos P chryptos and chloros P. Cloudy 5-10 N incoming tide barometer 766.2. Site 3 sampling happens at the end of one of the longest piers in Little Lagoon. 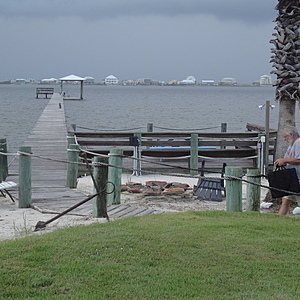 This site consistently has some of the best water quality in Little Lagoon, highest secchi readings, highest salinities, lowest bacteria and nutrient levels, and some of the best fishing in Little Lagoon. It also has some of the highest Spring and Fall Diatom bloom counts in Little Lagoon and has been the subject of extensive research concerning the toxic Diatom Psuedo-nitzschia. Hydrodynamics in the Lagoon are such that incoming tides typically turn to the west after coming into LL via Lagoon pass and this site receives some of the best tidal flushing in LL.